Sophomore album Bleeding on the Soundtrack will be released on Loose on 15th February 2019. Produced by Ethan Johns at Real World, it is the second instalment of William’s story following on from debut album, Proud Disturber of the Peace, released in 2017 to widespread critical acclaim. 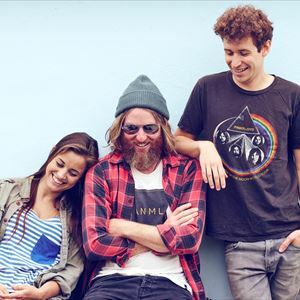 The indie-rock three piece channel classic blues and roots rock through a grunge/indie filter, with diverse influences including The Doors, Ryan Adams and The Lemonheads. Praised for their grit and authenticity by the likes of The Guardian and NPR’s Ann Powers, they made their mark at AmericanaFest in Nashville, signing to Loose and sharing the stage at the UK Americana Awards 2017 with the likes of Van Morrison, Richard Thompson and Ethan Johns. Proud Disturber of the Peace was shortlisted for the 2018 UK Americana Awards “UK Album of the Year”. “a mighty launchpad for what’s yet to come” Q ???? “a thumping Southern rock and Americana grungy gumbo that hits you right between the eyes” Express ??? ?